Ashima has managed YouGov panel client servicing in the region for over 4 years across multiple countries and industries and has 8 years' market research industry experience. on April 16, 2019, 10:24 a.m.
A fifth of UAE residents are likely to buy a first-hand car online, YouGov’s new research reveals. With Tesla betting big on online sales and the future of car buying believed to move the digital way, we asked residents how likely are they to buy a car online. A quarter (25%) said they will buy online if they have to purchase a second-hand car. Although traditionally, we see online car buying in the UAE being associated with pre-owned cars, the research shows that people are opening up to the idea of buying even a new car online. Other occasions when people would consider the digital route is if there is a great online discount or offer on the purchase (with 41% people saying that) or if there is a limited edition car model on sale (19%). 1 in 6 (16%) said they would buy a car online irrespective of the online offers or promotions but 1 in 5 (20%) will not buy a car online, even if there are great deals and offers on the purchase. At present, car-buying in the UAE is driven digitally to a great extent, with just under half (48%) saying they research and compare prices and features of different car models online when deciding to buy a car. For 1 in 5 residents (19%) presence of online car selling platforms impacts their car buying decision, with a higher number of men saying that as compared to women (21% men vs 14% women). Although there is an openness to explore the digital way, some consumers have concerns over using this medium. 1 in 6 (16%) feel online mode is great for research but buying a car should be done offline, while 1 in 10 (10%) are cautious of purchasing a car online and prefer doing it the traditional way. The UAE Government is making steady efforts to transfer all processes online with the Smart Dubai initiative. As a part of this, it launched the DubaiNow app, which covers all stages of driving a car in the Emirate, making car ownership easier and faster. Majority of UAE residents (73%) are happy about the introduction of this app. Half of the people (50%) feel this app will save a lot of time and effort and just under a quarter (23%) believe it will ensure more transparency between the parties involved. YouGov research also found out that at present more than half of UAE residents (55%) intend to buy a car in the next 6 months. Of these people, 64% would desire a brand new car while 36% would prefer a second-hand car. A higher number of men are looking forward to purchasing a car in the coming few months as compared to women (61% vs 45%). Half the people said the brand of the car and the fuel economy make the biggest impact on their decision to buy a car. Special offers and festive deals also influence the purchase decision of a potential car buyer. 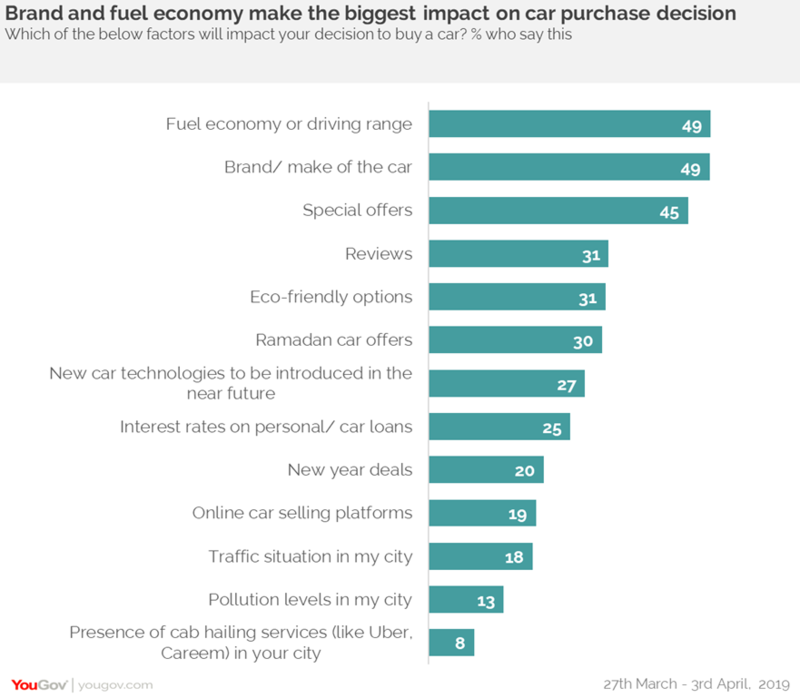 Carmakers will be pleased to know about customers’ enthusiasm to buy during Ramadan, with 1 in 3 people (30%) saying the Ramadan offers influence their decision to buy a car. Data collected online by YouGov Omnibus among 1,009 respondents in the UAE between 27th March and 3rd April 2019 using YouGov’s panel of over 6 million people worldwide. Data is representative of the adult online population in the country.